I’m puzzled by the accounting or law firm that continues to function today as it did many decades ago – in so many areas, as if the world continues to be as it was decades ago. 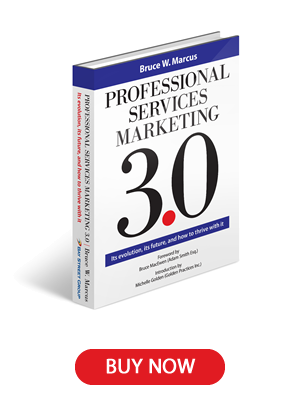 At the same time, in the midst of all that’s changing in the professional world, I’m surprised that change in the marketing process for professional services is evolving so slowly. There are indeed exceptions, in which a handful of firms have extensive programs that are innovative, and very large staffs to execute them. These few firms have specialists in such activities as business development, media relations, and so forth. But considering the vast number of firms, their number is a small percentage of the professions. There are many reasons for this, not the least of which is the amorphous nature of professional services management and marketing education. The quality of academic and firm marketing education in this field is dismal and retrogressive. The relationship between the marketers and the accountants or lawyers is too often built on mutual misunderstanding. And perhaps it’s because accounting and law firm marketing is so subsumed by a firm’s professionals with too little understanding of the process, that too many marketers are either unwilling to risk innovation or else are incapable of it. Perhaps, too, the external factors that require new vision for professionals and their marketers are happening too fast, and are overwhelming both. And perhaps the traditions and stringent (and sometimes anachronistic) ethical requirements of accounting inhibit innovation. Still, there are techniques to keep professionals relevant to the changing needs of the clients, and to keep marketing functional and successful beyond the mundane. For example, consider that while the ultimate aim of marketing professional services may be to get clients, growing a successful firm is a function of keeping a firm relevant to the changing needs of the clientele. Obviously then, the marketer must understand that environment, which then becomes the canvas upon which the marketing program is painted. This is certainly true in professional services marketing, where recycling old ideas instead of bothering to come up with new ones is a too common practice, and where the failure of professionals to fully grasp the reality of the crucial role that marketing plays in a practice tends to suppress innovation in so many firms.